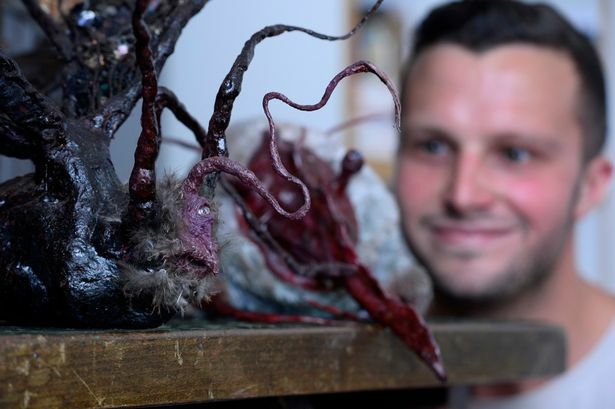 A Birmingham artist has set up shop making fantasy creatures to order and now counts city cinemas, media companies and castles among his clients. As a young sculptor, Tom Ellis started junk-modelling and his parents, both artists, saved him cardboard boxes and loo rolls to help create his otherworldly figures. He developed such a passion for model-making that he went on to study illustration at the University of Wolverhampton and started to bring his creations to life with mythical backgrounds and stories of their own. "I&apos;ve always loved making things," said Tom, 26, from Kings Heath. "Now, I give my characters mythical stories to give them more depth and history. It makes them more intriguing for people and sparks their imagination." Warwick Castle commissioned Tom to make the Greville Swan, inspired by the castle&apos;s crest, which was displayed beside Canaletto&apos;s paintings of the castle in 2013. And Tom was recently commissioned to make a model called Bloodscream for the Giant Screen Cinema at Millennium Point to mark its Heroes and Monsters season. He has also exhibited at the Electric Cinema&apos;s Shock and Gore season and is hoping to return to the Giant Screen Cinema to hold children&apos;s workshops soon. "Kids are so into Doctor Who and fantasy I thought they&apos;d love to make their own creatures with their own stories behind them," said Tom. "I thought when I started out that my work might have been too much of a niche but I find people are intrigued. "There&apos;s a fascination with fantasy in Birmingham and you can find lots of hidden events going on tucked away in corners of the city." Tom has an online shop called Curious Oddities which he sells through the website Etsy. His smaller figures take around half a day to make and sell for around £35. Larger creatures can take weeks to produce. * To find out more, visit www.curiousoddities.carbonmade.com and www.giantscreencinema.co.uk.